The 'Split Queen' entertainer of the country released her latest video statement against to the supporters of the Davao City Mayor Rodrigo Duterte. The real Mystica's voice will be heard on the said video that was uploaded to her official Facebook wall. Mystica claimed that she was not mad or angry to Rodrigo Duterte or even to the late president Ferdinand Marcos because they both not in the terrifying scene when her father was shot to dead and she was not blaming anyone. The only thing that she got angry is when we atone again for our decision in this coming election 2016. Mystica also said on her latest video that PDP-Laban presidential bet Rodrigo Duterte will be not the problem but those criminals on our community. She did not blaming directly the presidentiables, however, Mystica is getting mad to the 'power' that might be given by Duterte to all the authorities and anyone who holds guns & weapons if ever he become the next president of the Philippines. The rock diva is now on the 'hot seat' after her video becomes viral. She called Duterte a coward in her new video posted on Facebook. Many of the supporters of the Mayor attack her because of her video message against Duterte. "WE DONT' NEED A CARELESS, INSENSITIVE, OBNOXIOUS, ARROGANT AND VIOLENT DICTATOR LIKE DUTERTE IN OUR COUNTRY! HAVING A PRESIDENT WITH A MAD DOG'S BEHAVIOR AND AN UNLEASED ANGER IS LIKE LETTING AN UNSTABLE BOY WHO HAS NEVER GROWN-UP LEAD US AND WILL PUT US ALL IN JEOPARDY!" On her latest video message below, Mystica quoted saying on her latest video, "I HAVE MADE MY POINT BUT YOU ARE SO BLIND TO SEE THE TRUTH!" PLEASE SHARE!! 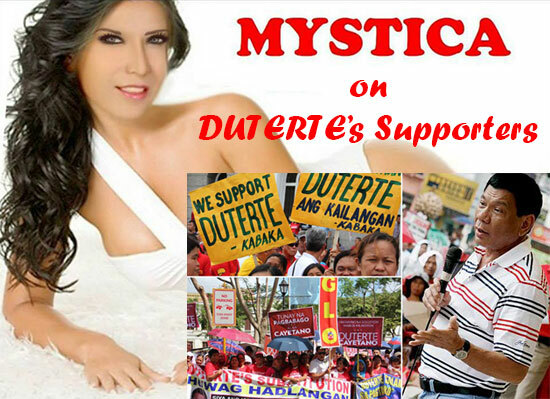 !,"
Mystica posted this new video today, April 19, 2016, as her message to all Duterte's supporters and believers. What is your thoughts on Mystica's Video? You may share your opinion below. Comments or suggestions about "Mystica to DUTERTARDS: 'I have made my point but you are so blind to see the truth!'" is important to us, you may share it by using the comment box below.